Since ancient times Persian cuisine has combined ingredients both familiar and exotic to produce a sophisticated feast which is simply impossible to compare to any other. Explore some of the historic and cultural sites of Iran while also exploring the incredible abundance and inventiveness of the Persian table. After your arrival in Tehran, you will be met at the airport and then taken to your hotel to check in and relax. Overnight stay in Tehran. You will spend a full day touring Tehran, the capital of Iran. Visit historic Golestan Palace, a Qajar era palace which combines Persian architecture with Western decorative influences. A UNESCO World Heritage Site, this lavish complex of 17 palaces and gardens is both a historic site and museum. You will also visit The National Archaeological Museum a show case for Iran’s rich and ancient history, as well as the Glass Museum and Carpet Museum. In the afternoon, you will learn about Persian cuisine in a cooking class. Overnight stay in Tehran. Fly to Tabriz, one of the historic capitals of Iran and an oasis at the foothills of Mt. Sahand, a silent volcano. Visit the “Blue Mosque” known for its splendid tiles, and The Azerbaijan Museum with its ethno-graphical, archeological and historical sections. Later see the Arg-e Tabriz, a 14th-century citadel. In the afternoon, you will learn about Persian cuisine in a cooking class. Overnight stay in Tabriz. You will leave Tabriz to go to Caspian Sea region, stopping at Ardebil to visit the Mausoleum of Sheikh Safi Ardebil- one of the finest historical examples of Persian art. If there is enough time, you will experience some of the traditional food of Ardebil and learn how to cook it. You will then travel to Bandar Anzali, one of the most important Iranian ports on the Caspian Sea. Overnight stay in Anzali. In the Morning and after breakfast, you will visit Visiting Anzali lagoon; then you will journey southwards on a scenic route to the picturesque town of Masouleh, perched on a steep mountainside and surrounded by dense forests. After exploring Rudkhan castle and Masouleh’s little alleys filled with handicraft shops and bakeries and enjoying the stunning mountain views from one of the cafes, you will continue along the sea to the popular coastal town of Ramsar. 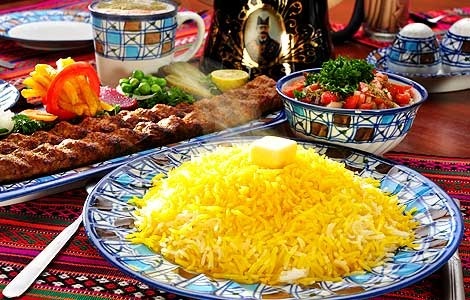 In the afternoon, you will learn about Persian cuisine in a cooking class. Overnight stay in Ramsar. Today you will have a leisurely drive to Tehran. Winding through and around the stunning Alborz Mountains, you will see beautiful forests, valleys and streams like Javaher Deh . Once you arrive in the afternoon, you will be free to explore Tehran. Overnight stay in Tehran. Today you will leave for Imam Khomeini International Airport and fly home.